Rollout: 9:58 a.m.; 37 degrees, constant rain. One of those rides to look forward to, mainly in anticipation of watching the grit and grime run into the drain while enjoying a Tecate in the shower afterwards. 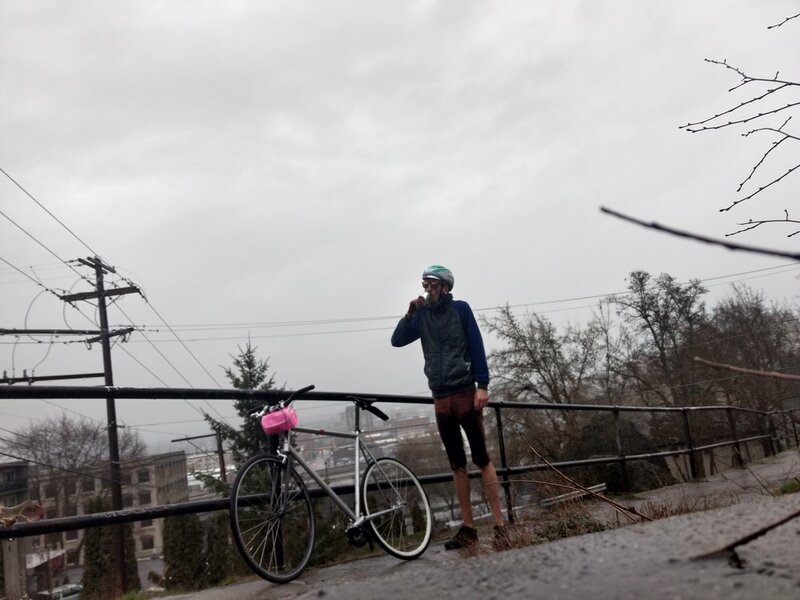 Spent almost an hour crushing climbs, smashing gravel, pounding brick and sometimes walking bikes in appropriately April weather. In terms of enjoyability, the ride mirrored a toddler playing in puddles: everyone is having a lot of fun until the cold water soaks through. Inspiration: Paris-Roubaix and Spokane's cobbled history. Plan: European adult beverages; riding Spokane's oldest streets. Details: 7 April; 11 a.m.; meet in front of the old library (10 S. Cedar St.). Coffee available near by at Rocket. In lieu of cold showers, beverages provided at the finish. GEG-RBX will begin near downtown, head through Browne's Addition before gravel crunching through High Bridge Park to Cannon's Addition. The ride will then snake through the neighborhoods, hitting 17 sections of more than 5k (~16,586 ft) of early-1900s brick and cobbled roads. Route map is up now. Spotlight on Madison from Fifth to Sixth: the low-key hardest hill in Spokane. Fifteen percent for two blocks (very short - only 163m total!) and 20.6% for the last third. Make it to the top (anyway you need to!) for a cool, refreshing affirmation of your grit.